The Cyclone Global Navigation Satellite System (CYGNSS) was launched in December 2016. Image: courtesy of Southwest Research Institute. CYGNSS consists of eight microsatellites. Image: courtesy of Southwest Research Institute. CYGNSS has a designed lifespan of approximately two years. Image: courtesy of NASA. 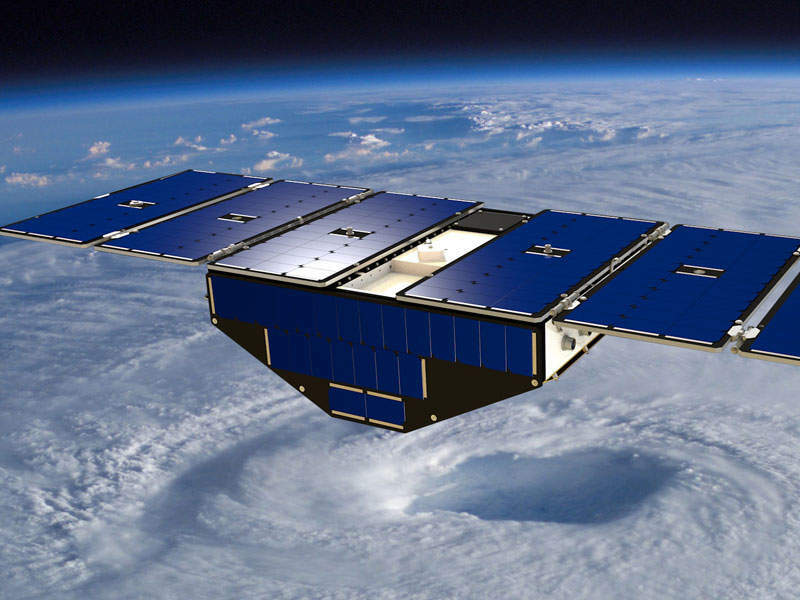 CYGNSS will help improve extreme weather predictions. Image: courtesy of University of Michigan / Joseph Xu. Each of the eight micro satellites is fixed with four GPS receivers. Image: courtesy of University of Michigan/Joseph Xu. The Cyclone Global Navigation Satellite System (CYGNSS) probes the inner core of hurricanes to learn about the rapid intensification. Consisting of a constellation of eight microsatellite observatories, the system is placed at Low Earth Orbit (LEO), approximately 510km above the surface at an inclination of 35° from the equator. CYGNSS was developed by Nasa as part of its Earth system science pathfinder programme launched in June 2012, in association with the University of Michigan, and the Southwest Research Institute (SwRI). It was launched from Cape Canaveral Air Force Station in Florida, US, on-board Pegasus XL rocket in December 2016. CYGNSS comprises eight micro satellites, each weighing roughly 29kg (64lbs) and equipped with four GPS receivers. Each satellite has external dimensions of 51cm x 64cm x 28cm. 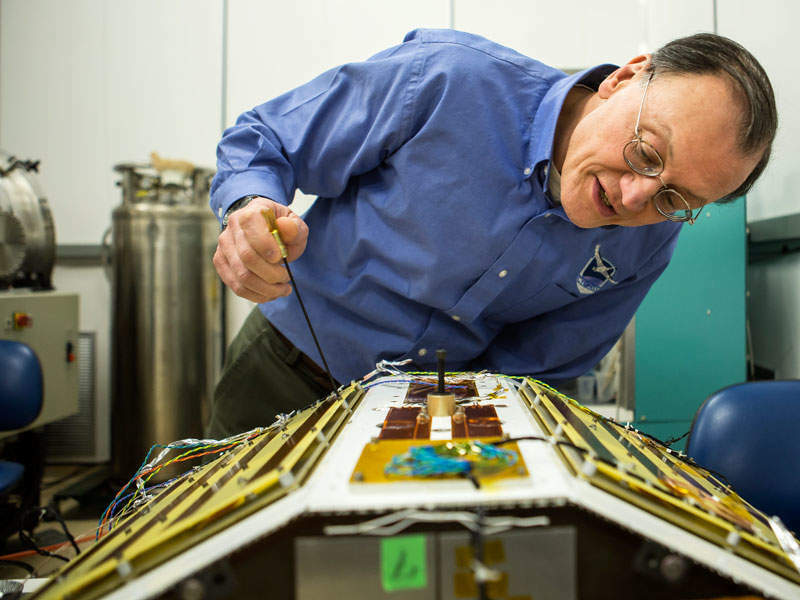 The structure of the spacecraft integrates microsatellite and instrument electronic boards. 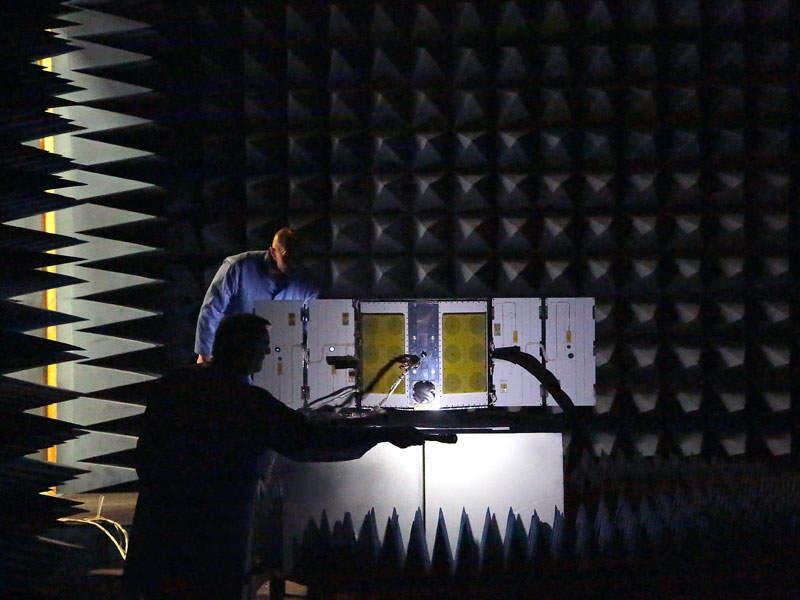 CYGNSS carries a Delay Doppler Mapping Instrument (DDMI), including a Delay Mapping Receiver (DMR) with two nadir-pointing antennae and one zenith-pointing antenna. It is designed for a lifespan of approximately two years. The detailed design of the satellite was completed by January 2015. The assembling of eight microsatellites began in August 2015 and was completed in February 2016. The functional and environmental testing of the satellites was completed in August 2016 and the system was transported to Vandenberg Air Force Base for integration with the Orbital ATK Pegasus XL launch vehicle in August 2016. 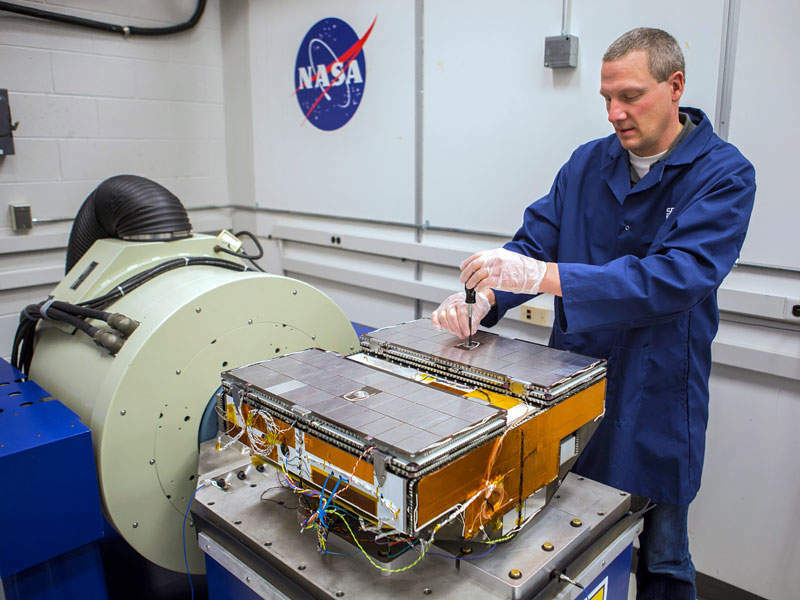 The University of Michigan was selected to provide CYGNSS mission design and implementation, including the design of the constellation and production of retrieved surface wind speed estimates. The design for CYGNSS was completed at Science Operations Centre located at the University of Michigan. Southwest Research Institute (SwRI) was selected to construct and test each of the eight CYGNSS microsatellite observatories at its Mission Operations Center. SwRI is also responsible to offer risk management, systems engineering and mission assurance for CYGNSS. 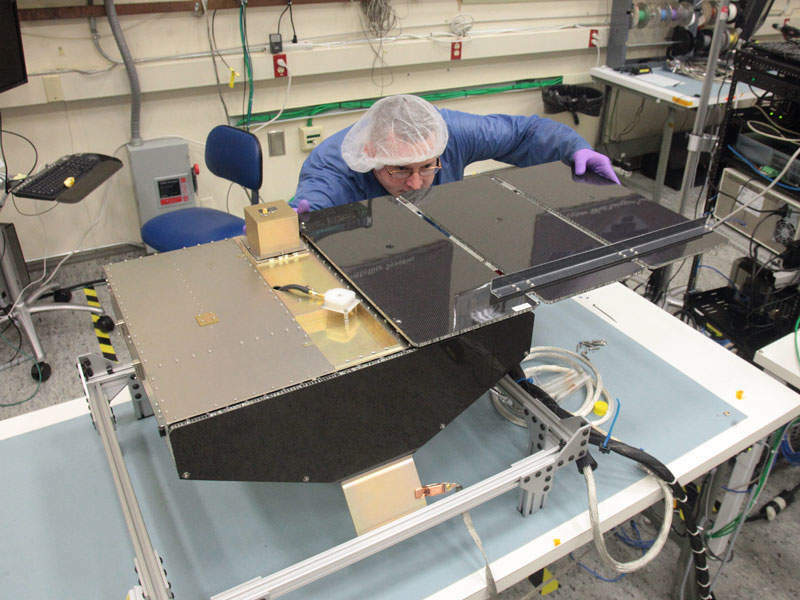 Surrey Satellite Technology was contracted to design, manufacture and test the Delay Doppler Mapping Instrument (DDMI), a science payload integrated on each CYGNSS microsatellite observatory. The company also provided GPS receivers and other antennae for the CYGNSS satellites. The deployment module for CYGNSS was provided by Sierra Nevada Corporation. The objective of the CYGNSS is to understand how the ocean surface properties, moist atmospheric thermodynamics, radiation and convective dynamics interact to control the development of a tropical cyclone. CYGNSS observatories receive both direct and reflected signals from four independent transmitters in the operational GPS network and measure surface winds in and near the inner core of hurricanes. Each satellite observatory is able to measure four simultaneous reflections, which results in 32 wind measurements per second across the globe. The constellation of eight satellites provides gap-free Earth coverage. The observatories have a median revisit time of three hours and a mean time of seven hours over the critical latitude band for tropical cyclone formation. Orbital Sciences Corporation was awarded a contract to launch the CYGNSS multi-satellite mission on-board a Pegasus XL rocket in April 2014. The small space launch vehicle launched the satellites into LEO orbit using the patented air-launch system located below Orbital’s “Stargazer” L-1011 carrier aircraft over the ocean. The rocket placed the CYGNSS in LEO orbit in a three-staged launch.